Pragmatic Play’s latest releases, 7 Monkeys slots, is available for you to play at Vegas Spins Casino. Loaded with 5 reels and 7 paylines, the game is themed around a number of colourful monkeys that are not only crazy, but offer big rewards as well. Embark on a one -of-a-kind adventure in this humid jungle where you can benefit from free spins, wilds and scatters. You can win on this slot game with the multiple symbols available on the grid. These are yellow monkeys, green monkeys, orange monkeys, blue monkeys, pink monkeys, rainbow monkeys and bananas. When opening 7 Monkeys slots, you will notice a number of controls on your screen. For example, the Autoplay feature allows you to select from 10 to 1,000 games to play per spin. Other options allow you to select your bet amounts and more. Bet Levels:Bet levels range from 1 to 10. Amount of Paylines Selection:All 7 paylines are fixed. Coin Values: Coin denominations range from £0.01 to £50.00. The wild card takes form of the Rainbow Monkey. This replaces for all symbols bar the scatter symbol. The scatter symbol are the Bananas, which triggers the bonus round of the game. 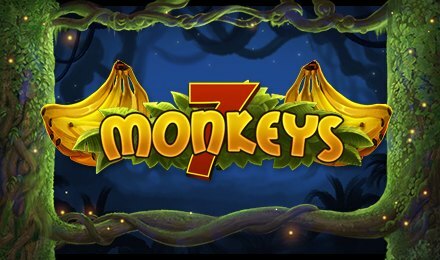 Win an unlimited amount of free spins on 7 Monkeys slots. Landing three, four or five scatters anywhere on the slot grid will award you a distinct amount of free spins and multipliers.